Rimfire rifles, though old in make, are very popular nowadays. A .22LR rifle can shoot to about 50 yards with less than 1″ bullet drop, but just owning the gun alone will not give you the optimal experience that this cartridge can provide. Sure, this may cater to some of your shooting needs, but when it comes to hunting small game or even plinking, the range might feel extremely limited. And this is precisely where a rimfire scope comes in. Not only will it be able to maximize your gun’s range but significantly improve the accuracy as well. But with so much variety in the market, finding the best .22 scope that fits both your needs and your gun can be extremely difficult. So, in this guide, we’re about to tell you about the best rimfire scopes you can buy right now. So, sit back and read along! But before you decide on the scope, it’s a good idea to decide what magnification you need beforehand. This is based on your usual shooting distance. If you want to shoot on all distances just get a scope with a wide variable. If you are new to rifle scopes, check what variable and fixed scopes are here. The ranges are rough estimates based on a standart barrel length of 18.5″. If your targets are at a close range then for the best accuracy and view, you will be needing a scope that has a 1 to 4x magnification. For shooting targets within the 50 to 100-yard range (like pests and rodents), then a scope that offers 4 to 7x magnification would be the ideal choice. When it comes to shooting at a long-range, clarity is of utmost importance. When shooting at 100 yards and above, and it’s best to look for a scope which can reach at least 7 to 9x magnification power. There are numerous reasons why we believe any of these could be the best rimfire scope for you. If you keep reading, you’ll find out what those reasons are. Let’s get started. First, on our list, The Prostaff Rimfire II is guaranteed to be a worthy addition to your rimfire rifle with its ultra accurate and crystal clear optics. This is probably the best selling rimfire scope and a personal favorite of ours. Even though it has a fairly large 40mm objective lens, the scope is quite compact and lightweight. At 12.3 inches in length and a weight of a meager 13.1 ounces, carrying it around is a cinch. Rimfire rifles are not supposed to be heavy after all, right? From 3X to 9X, the magnification is absolutely stellar and lets you zoom into your target at almost HD quality. The crispness, clarity, and contrast in the image are top-notch throughout the entire zoom range. The power selector is at once, very smooth but also resistant enough to accidental changes in the power. The variable magnification ensures you can use the scope in various shooting scenarios. The 9x power is enough for the full range a rimfire rifle can shoot on. The scope offers generous eye relief at 3.6 inches which is adequate for basically all rimfire applications. Moving on to the optics, it is fully multicoated, maximizing light transmission (touted as 98%) giving you visibility even in very low-light conditions. The focus is fast and sharp and guarantees that nothing is going to get past you, no matter how fast. This scope is equipped with the BDC 150 reticle, with several open circles for bullet drop compensation. It was designed with rimfire rifles in mind and caters to the ballistics of the cartridge. The only drawback here is that the reticle is not illuminated and is wired, instead of being etched on the glass. The Prostaff Rimfire II provides you with a pretty good field of view, from 4.4 feet to 33.8 feet at 100 yards. Nikon has left no stone unturned when it comes to durability. The optic chambers are nitrogen purged, and the lenses have been sealed with 0-rings. This makes the whole scope waterproof, fog proof and also shock resistant. Ideal for use in extreme weather conditions. Add to that a lifetime warranty, and this scope will last you a long time. All in all the Nikon ProStaff is just incredible when it comes to durability and sleek design. No matter what weather or condition you decide to use it in, it’s incredibly reliable and will not let you down when you are shooting anything above 25 yards. 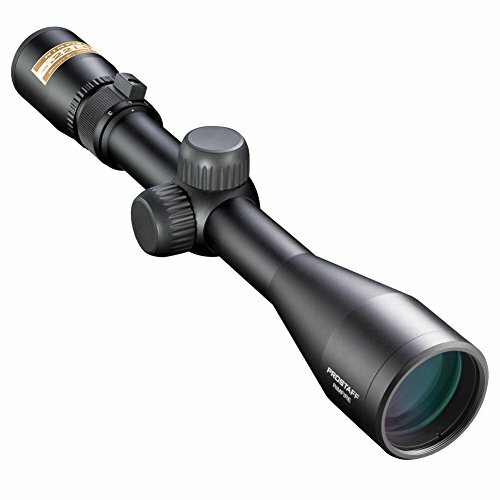 If you are looking for just a bit extra magnification, check the Nikon Prostaff Rimfire 4-12X40mm. Bushnell has been a household name when it comes to optics for 65 years now. They are dedicated to churning out quality products which are reliable, precise, sturdy and affordable. And the best part is that the company blends modern technology with their tried-and-true techniques and then make it accessible for every American. 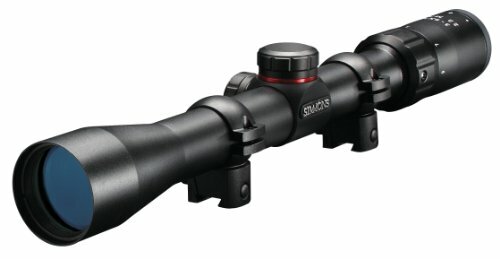 What Makes This Scope a Good Choice? Let’s start out with what really makes this scope worth the money. What we really enjoyed about this rifle is the BDC reticle (Bullet Drop Compensating) and the adjustment features. As is typical with BDC reticles, it is a second focal plane article which means that the image of your prey stays the same size whether you’re zooming in or out. The magnification is 2-7x which makes it a perfect choice for rimfire rifles, especially if you like to shoot on short and medium ranges. The reticle features a zero at 50 yards with additional aiming points up to 125 yards. In order to hit those long distance shots, this scope is also outfitted with target turrets for wind and elevation adjustment. They offer quick, precise adjustments of 1/4 MOA with every click. Next comes the picture quality. Several layers of anti-reflective coating on the lens ensure that most of the ambient light gets transmitted through, forming a picture that is bright and clear, with vivid contrast. Whether you take it out under the bright noonday sun or in the wee hours of dawn or at the end of the day, this scope will form bright images without fail. Another aspect where this scope does really well is in sturdiness. Made out of aircraft grade aluminum, the scope is resistant to scratches, rust and will hold its own regardless of how rough and unforgiving the conditions are. The lenses, themselves are just as durable. Nitrogen purged, and O-ring sealed, they are completely waterproof, fog proof and dust proof. Foreign particles simply won’t be able to get into it. The scope can stay totally immersed in water, and the scope will be as dry as the day you bought it. The optical surfaces will never fog up due to extreme changes in temperature or humidity. This scope does a great job of accounting for bullet drop compensation over long ranges with its adjustment turrets and the BDC reticle. This accuracy and precision, coupled with the sturdiness and longevity, makes this one a winner in our books. A good choice for the 17 HMR as well. Design wise, this one from Simmons might be the best one on our list. Sleek, and sophisticated, it has a one-piece body which allows for lighter and more flexible handling along with added durability. Why Should You Buy This Scope? With a 12-inch length and a weight of 10 ounces, it’s a little on the heavier side, but it more than makes up for it in durability and aesthetic appeal. It really does look like it’s straight out of a movie. It’s effortless to mount as it comes packaged with a whole set of mounting rings. The eye relief is a modest 3.5 inches, but the scope holds steady even with decent recoil. So there are no worries of injury. Simmons TrueZero windage and elevation systems lock on to your target with dead set accuracy, which is further bolstered by the QTA (Quick Target Acquisition) eyepiece. Getting your target in your sights has never been easier. To make things even more comfortable, this scope features sure grip technology which allows you to make adjustments seamlessly even while wearing gloves. The lens is fully coated and feature a HydroField technology, which lets you use the lens flawlessly under all weather conditions. Light reflection and glare are almost negligible. It has a truplex reticle and a field of view which goes from 5 to 31.4 feet at a 100 yards. When it comes to the category of low-cost budget-friendly scopes, the Simmons 3-9x32mm, 0.22 Mag(R) is indeed one of the best that the current market can provide. And if we compare all its pros to the cons, then the positives win out by a long shot. Would also be one of the best M&P 15-22 scopes. When it comes to professional grade high-quality scopes, nobody does better than Vortex, and they have come up with yet another frontrunner. What Makes This A Great Buy? Vortex has packed a ton of features into this without hiking up the price or sacrificing on the quality. 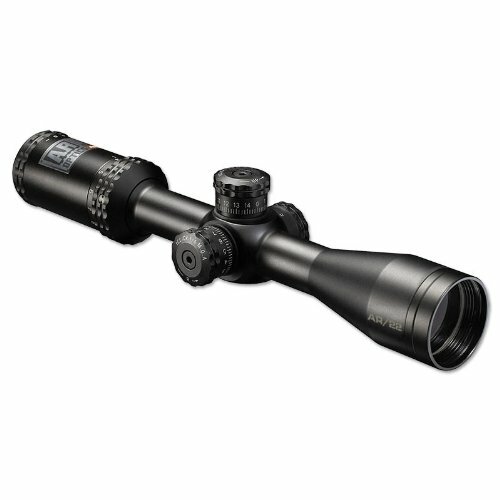 These include multi-coated lenses, aircraft-grade aluminum, multiple reticle options, and fog and waterproofing. One of the best options out there for medium to long range shooting, the V-Plex MOA Reticle gives you unmatched accuracy. It’s highly functional, intuitive, and has plenty of hold points never once getting too cluttered. The reticle was etched in the second focal plane to keep the image always at an ideal size. The lenses are multi-coated with an anti-reflective coating for maximum light transmission and minimal glare. This provides sharp images, high contrast and bright images even in very low-light conditions. The eye relief is at a decent 3.9 inches, and the parallax is factory set at 50 yards. As for the field of view, it is quite impressive and goes from 12.6 feet to 42 feet at a 100 yards. Made out of aircraft grade aluminum, it’s a one-piece model with an anodized exterior coating which protects the tube from scratches, bumps, oil, and dirt. Apart from that, nitrogen purge and O-ring seals make for a waterproof, fog proof and shock resistant body. What really takes the cake is the craftsmanship of the reticle though. It is hash marked for ranging, holdover, and windage corrections. The high-precision laser etching on the glass reticle is set to keep to the tightest tolerances possible. The crosshair is perfectly designed for maximum balance between precision aiming and light visibility. The capped tactical turrets give your precise control for fast elevation and wind adjustments. This is also complemented by an integrated locking mechanism which prevents inadvertent alterations. The Crossfire II Rimfire Riflescope is the latest addition to the Vortex lineup with its V-Plex reticle, which some shooters prefer over the BDC reticles. Another ideal choice for .22 rifles. In today’s age of ever advancing science and modern technology, we know how difficult it can get for any budding rifle enthusiast to choose a .22lr scope. So, if you are looking for a piece that is quite durable and can serve you for an extended period of time, then the Nikon Prostaff can be the best rimfire scope. And if you’re new to the field of rifle shooting, then the P-Rimfire is going to be your ideal match. While the Vortex, on the other hand, is more for the professional hunter, the Simmons is just amazing for accuracy and precision.